Amid Evil is Heretic, in some alternate universe where FPS games stayed weird, niche and mechanics focused. I’ll admit when the game arrived in my inbox I did a double take, since I had reviewed DUSK mere weeks ago and many of the praises I can sing to that game are also true for Amid Evil. They’re both published by New Blood Interactive, both are surprisingly modern feats of game design wrapped in a retro-loving shell, and they share the same mechanics just as Doom and Heretic did in the 90’s. Developed by Indefatigable, Amid Evil takes all the interesting ideas from Heretic, mixes in a little Quake, and filters out only the good bits to deliver a nostalgia hit somehow more potent than playing the original game itself. If you grew up with the original Heretic, you’re going to have a very different experience playing it compared to someone who’s been spoilt by modern FPS sensibilities. Heretic is evocative and surprising in its design, but it’s certainly held back by the weight of being an overly-ambitious early-90’s shooter. It was built atop a heavily modded Doom engine by a fledgling Raven Entertainment Software (a developer that would eventually go on to provide session work for nearly every main series CoD game) and came together with a little elbow grease from John Romero himself. It was the first game to allow the player to aim upwards and downwards, and its advanced physics and geometry systems gave way to labyrinth-like levels filled with switches, secret rooms and traps. Whereas Doom had simple levels with the sole objective of pushing the player against an onslaught of enemies, Heretic required you to explore and solve puzzles all while being beset by enemy attacks from all directions. Going back and playing Heretic today is rough going unless you’re already seasoned, being able to predict where the ambushes are and knowing which walls to prod to get some precious additional ammo. (Also Heretic had a really cool dark fantasy theme going on and that was pure immersion back in the day for D & D nutheads - ed). 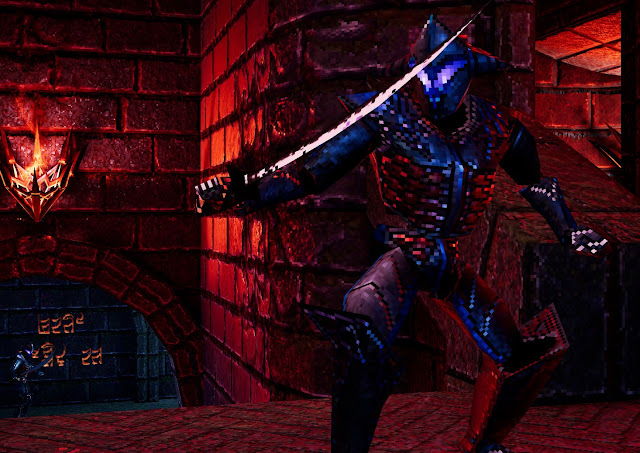 Amid Evil’s greatest strength is that it feels like playing Heretic, but with all the 90’s idiosyncrasies sanded away. A player born after the turn of the millennium can enjoy this one just as well as a seasoned fan, thanks to smart level design and briskly paced gameplay. The levels are full of secrets, switches, verticality and traps, but they never feel as daunting as older fare. The game uses visually striking “hub areas” in the larger levels which the player returns to multiple times, as well as twisted architecture that conveys the sense of an alien location without actually being confusing to navigate. This means that the game’s levels are all big and weird, but never tedious. 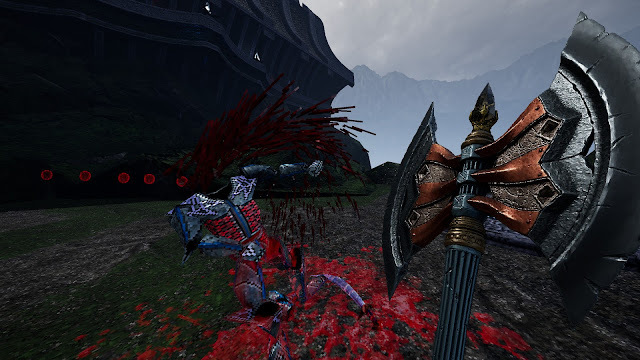 Weapons look visually distinct from the standard FPS fare and call back to Heretic’s staffs, axes and swords, but each has their distinct use in combat and there’s lots of fun to be found in figuring out exactly what each weapon can do, and when best to use it. Health drops are scattered throughout levels to encourage players to stay on the move. Each design choice is tailor made to organically create the kind of gameplay experience Indefatigable clearly feel when they booted up an Id Software or Raven Entertainment game for the first time. The game’s attention to detail is nothing short of admirable. Each set of levels, billed as a chapter, sees the player infiltrating a cathedral-like structure filled with enemies. The game’s aesthetics make great use of striking imagery, contrasting foreboding Romanesque architecture with otherworldly curves and crescents embedded into jagged and organic textures reminiscent of a cliff face. The result is an environment which screams “forbidden ancient evil” with every inch. Enemy designs also make the most of the level design – flying enemies shoot projectiles in wide open courtyard spaces, while even the most basic melee mook can leap from high areas to catch you from behind. The player is given an eclectic array of fantasy weaponry to toy around with in this hostile environment. Starting out with a mere heavy melee axe, the player soon gains access to a homing-bolt-firing-staff, a wind-slash sword, an electro-trident and a sceptre that chucks miniature exploding planets at enemies. They’re all a far cry from standard FPS fare, which is a nice update from Heretic’s original arsenal which looked unique but were actually just expies of the Doom loadout. In Amid Evil, every weapon has a basic fire and an overdrive mode which activates upon collecting enough souls from your fallen enemies. Overdrive mode turns the weapon into an unstoppable killing machine, allowing you to reduce your opposition into a substantial amount of gibs. It leads to a compelling risk-reward factor in combat: shooting from range is safer but less interesting, while going in guns blazing can lead you to a swathe of flashy overdrive kills. 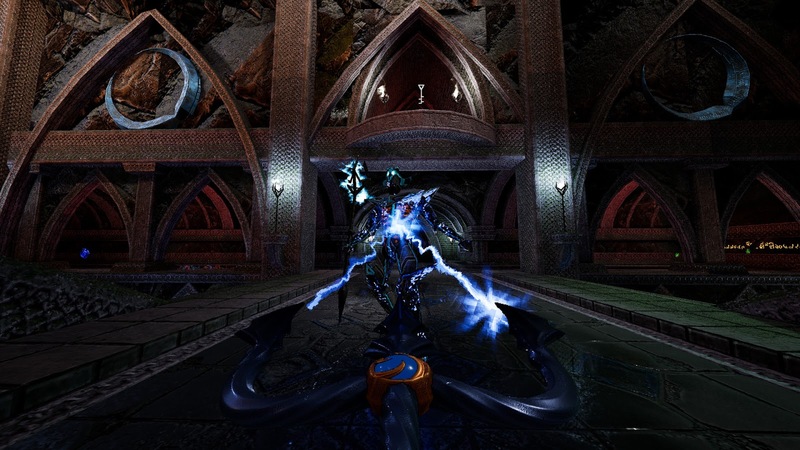 Amid Evil is a wonderful dance of intriguing levels, powerful weapons, smart enemy AI and good setpiece design. When the game is working at its best, players will be frantically scouring levels for health orbs and mana for ammunition with enemies hot on their tail. Harder difficulties dial down the amount of resources you get, which means a lot in a game with finite ammo and no regenerating health. For the 90’s shooter veteran, Indefatigable also offers a hefty challenge with a high skill ceiling. If I had to make one complaint, it’s that boss design is a notch weaker than other aspects. The normal levels end somewhat anticlimactically with the player finding a door to the next one, so I was delighted to face the first boss – a hulking sorcerer who fires moons that bounce around the room. Unfortunately, the fight seemed to misunderstand what the rest of the game does so right; the main enemy is easy to hit with your weapons yet his attacks are hard to dodge, and scrounging for health pickups mid-fight is the only way to survive long enough to win. Later bosses are a marginal improvement, but they never met the ethos of exploration mixed with combat that the levels themselves did so well. All in all, Amid Evil is a phenomenal take on 90’s shooter design. Built upon an ethos of capturing the feel of retro sensibilities rather than being tied to the archaic systems that came with earlier designs, Indefatigable have crafted a compelling game sure to delight new and old fans alike. This isn’t a shallow experience built solely upon the shock value of pixelated violence – it’s a game about navigating unfamiliar territory, exploring alien environments and surviving with quick wits and reflexes. In remaking an old game for modern audiences, Amid Evil delves down to the molten core of Heretic and proves that there’s still life in a decades-old genre.